As mentioned briefly in my introduction page Pixel Hiker was born out of recognizing that despite all the information on the internet there was a niche where hiking and photography exist hand in hand. My research has lead me to understand that questions such as “Whats the Best Tripod for Hiking“, “What’s the Best Backpack for Hiking with Camera Gear” and “What’s the Best Way to Carry a Camera When Hiking” do not have simple answers because everyone’s needs are different and those individual needs are critical. Often the responses I read at hiking or photography websites gave answers that were either generic or answers that applied to the person responding about their own needs while the person asking the question was never very specific about their needs. The title above says it all. To know what works best for you requires a reasonable understanding of yourself, your body, your camera gear. When you think of hiking do you imagine walking for days through the mountains on some gorgeous trail? Do you imagine walking the great plains of the Serengeti? or does your vision of hiking resemble something closer to mountain climbing? or a combination of any and all of those. As an example for myself I was looking at straps and harnesses for my next trip to Franconia in the White Mountains of New Hampshire a few photographers mentioned they use a Black Rapid RS4 strap for hiking. I found this humorous because I use the RS4 as my primary strap because it allows me to grab the camera quickly to take pictures, the RS4 also is strapped very securely to my body. 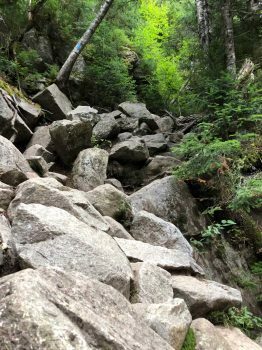 However that freedom of fast pictures also means the camera is free to swing around and this is a non starter when ascending the Franconia Ridge loop (See image above). There are times when I have to literally climb and crawl on all four and this would mean my Nikon D810 could be bouncing off rocks which is obviously unacceptable and that again is my point. There is no single solution that works for everyone and in fact I have found I need multiple solutions based on my activity. Below is a short list of items to think about when you plan on hiking with your camera gear. This should help you be honest with yourself so you can find what works best for you in a given hiking scenario. Gender – Simple fact no two bodies are the same but obviously there’s a big difference between male and female anatomies and how gear needs to fit them. A camera strap, harness or backpack that might be fine for a man might be uncomfortable on a female anatomy. So this should be a consideration when looking at designs and reading reviews. Physical Condition – Simply put your physical condition might limit how much weight you can carry. Additionally maybe you have limited movement with part of a body or some other condition. This is also a consideration. In my case I have a 6″ steel rod called a “Harrington Rod” fusing 6″ of my spine. I do have some movement issues and I am also prone to back pain. For that reason I have to be very picky about buying backpacks, what I care and how the weight is positioned. Equipment Risks – Depending on the type of hiking or backpacking you are doing your gear might need to be protected in a specific manner. As I mentioned in the introduction there was no way I could use my Black Rapid camera strap at Franconia because my camera would have been bouncing off rocks. There are other risks as well, like walking through heavy brush or or cliff side trails to name a few. Duration of Hike – How long will you be hiking? The longer you hike the more supplies you need to carry in addition to your camera gear. This also plays into the Physical Condition above. Location – Reiterating what was stated above. Someone hiking up Mount Washington has different needs than someone backpacking the African plains or a Utah Desert. What will you be photographing – Now here’s where thing get a little more complicated. If your hiking to reach a specific photographic goal like the summit of a mountain or a Mayan Temple then you are probably content to keep keep your camera stowed in your backpack but if your trekking through Yellowstone or on an African safari you probably want to keep your camera handy. Of course as a photographer you always want your camera handy but based on the the above scenarios that simply may not make sense. Fortunately in this day and age there is no shortage of ingenuity and it’s evident with the plethora of dedicated photography backpacks, straps and harness but I believe that there isn’t one size that fits all and the more diverse your activities are the more gear you will need. In part two of this post we will cover specific gear.